A couple of London ladies are embarking on an incredible adventure, mounting trusty steeds this summer to trek all the way to Turkey to raise money for the charity SOS Children. Zena Fish, a South London teacher, had never got on a horse until recently but will be straddling one for a very long time indeed come August. The route to Turkey should take about a year. Zena reckons the worst bit will be getting out of London and they've yet to hit upon the best route. Surely they should start in Green Lanes? Astonishingly, her friend Becky Sampson - horse mad adventurer - is going on to continue the trek right through to Tokyo with Zena back home, managing the epic journey from London. Expedition Equus is not only a fundraiser for orphans but a vehicle for highlighting eco-tourism. They will also be offering their qualified teacher status to kids in SOS Children's villages along the way and following in the footsteps of traders along the historic Silk Road. That'll be 4 years in the saddle. Cripes. Serious business, rather than a jolly hack across 3 continents. Indeed, they will be the first women to complete this journey on horseback. With the blessing of Sir Ranulph of Fiennes and with Mooncups packed, we wish them fair weather and no saddle-soreness. You can support Expedition Equus at their Justgiving page and find out more about the grand scheme at their website. 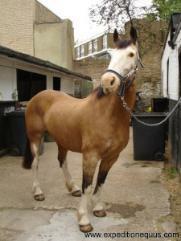 Image of Banjo the Horse courtesy of Expedition Equus.